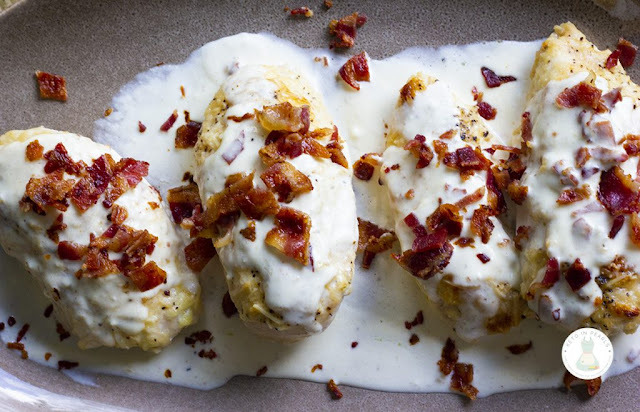 Juicy baked chicken breasts are topped with a bacon cream sauce and fresh fried bacon bits in this incredibly easy and wildly popular recipe. Okay, I’m hungry just after typing the title! I promised my Instagram followers I’d post this recipe I made the other night! As some of you know, my husband and I recently switched to a ketogenic diet. We wanted to get healthier, set better examples for our kids, and generally feel good. Pat chicken dry. Use a silicone basting brush to spread mayo evenly on top of chicken. Top each breast with 1T parmesan cheese and place in baking dish. Bake uncovered 40-45 minutes until internal temperature is approx. 160 degrees and juices run clear. When the chicken has about 10 minutes left in the oven, begin sauce. Using a non-stick skillet, warm up the reserved bacon grease over MED LOW heat. Be sure it does not start sizzling or bubbling. Whisk in the heavy cream until well combined. Continue whisking until the mixture starts to foam up on the edges of the skillet. Add the cream cheese and whisk until smooth. Add last tbsp of parmesan and garlic powder and whisk until smooth. Toss in a few bacon pieces, making sure to leave enough for the top of the chicken. Each breast should be topped with 2-3 tbsp of sauce and a few bacon crumbles. Leftover sauce may be refrigerated in an airtight container for up to 1 week. I like to serve this with mashed cauliflower! This recipe can easily be doubled for a larger crowd. 0 Response to "Parmesan Crusted Chicken with Bacon Cream Sauce"